Alex Gray (left) and Matthew Lillehaugen were selected to represent Concordia in Norway next summer at the Nansen Center for Peace and Dialogue. Both were selected as 2015 Peace Scholars along with others from ELCA colleges. Photo by Maddie Malat. Peace Scholars will learn logistics of peace across the globe. 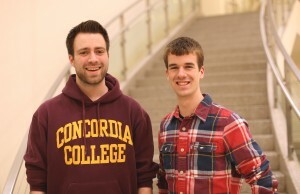 President Craft declared Alex Gray and Matthew Lillehaugen as Concordia’s 2015 Peace Scholars on February 20, 2015; these two students have already begun to fulfill their title only a couple weeks after being announced. Peace Scholars, Gray and Lillehaugen will delve into theories revolving around peace, war and conflict. To begin their journey, the scholars were introduced at the Nobel Peace Prize Forum in Minneapolis on March 6. At this forum, they met the other Peace Scholars from participating schools: Augsburg College, Augustana College, Pacific Lutheran University, St. Olaf College and Luther College. They also heard from influential speakers such as former President Jimmy Carter and former Norwegian Prime Minister, Gro Harlem Brundtland. This summer, Lillehaugen and Gray will be at the Nansen Center for Peace and Dialogue in Lillehammer, Norway. Here, they will observe dialog sessions with students from the Balkans and Caucasus regions. The rest of the program resides at the Oslo International Summer School. They will continue their Peace Scholar Seminar and take an undergraduate course in which they’ll receive credit for two courses. The scholars will be in Norway from June 14-July 31. Concordia pays for the scholars’ tuition; the students only have to pay for travel expenses. Both students said they are excited for the change in surroundings. While in Norway, they are expected to blog about their experiences. When they come back, they will continue their position as Peace Scholars by holding presentations about their experiences, promote the program on campus and play a leadership role in peace activities. Gray said he’s been to Canada, but neither scholar has been overseas. Lillehaugen is excited to learn perspectives from people of different cultures. For Gray, this experience provides more than a learning opportunity about peace and conflict; it provides preparation and abroad experience for when he goes to India this fall for the Social Justice, Peace and Development program. Before all of this could happen, the scholars had to apply to the program. To apply, the students must be a sophomore or junior, have at least a 3.0 GPA and be able to attend all required events. Gray and Lillehaugen had to send their transcript, resume, two recommendation letters and a 1,000 word essay to Dr. Milda Halvorson, chair of the selection committee for the Peace Scholars program. There are two other members on the committee: Susan Larson, psychology professor and Joy Lintleman, history professor. The committee had nine applicants to choose from. These applicants have a range of majors. Gray is double majoring in Political Science and Social Studies Education while Lillehaugen is majoring in Political Science and Global Studies and minoring in Physics and Mathematics. The committee selects members by their ability to lead by making peace. “We’re looking for people who are active, who are engaged, who have good communication skills,” Halvorson said. After they review the applications, the committee invites eight or nine students for an interview. Before the interview, they give the students one question about what possible research they could do in Norway; the students explain their answer and the committee asks follow up questions about the research. Afterwards, Halvorson creates a document describing each candidate based off their application and interview and sends it to Craft, who makes the ultimate decision on who will be the Peace Scholars. Sage is the Co-Editor-in-Chief of The Concordian. She is a senior majoring in Multimedia Journalism and Spanish and minoring in Communication Studies.